This is now my seventh post in this monthly post series, and I’m happy that I’ve been continuing with them. Aside from being interesting to readers, it’s also a good motivator for me. I now calculate my daily and monthly earnings (gross, net, ROI, etc.) every morning, and run the average to see what I’m on pace to hit for the month. My goal is always to set a new personal best. Doing these income reports also makes me more accountable, as I feel a bit embarrassed when my campaign earnings drop. "In fact, I don’t think July will just be a lot lower, but actually in the 4 digit net profit range, instead of the mid-5 digits that I have been doing." Up until now, every single time I predicted that my next month’s earnings would nosedive, I’ve been wrong. Unfortunately, I was right. July performed far worse than June. The good news is that it did better than the "4-digit net profit range". The bad news is that I only made half the profit in July of what I did in June. Man, what a drop from June ($142,606.00 –> $64,950.00). In fact, this is the lowest gross amount I generated all year. Talk about a drop. The month before, June, brought in a total of $52,447.17 net profit, so July saw my profit drop nearly exactly in half. My ROI did jump significantly this month though, from 58% to 70%, but really ROI is pretty meaningless when you’re talking about overall monthly numbers. Net profit is really all that matters. While July definitely took a major hit (it’s actually my second-worse month this year so far), when I look at the numbers in the table above, it actually doesn’t look so bad. I think it’s partly because my Net column is still all green, and partly because my net column is still all 5-figures. 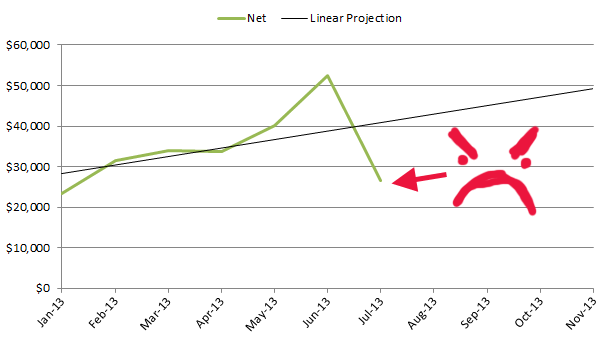 As you can see, July certainly messed up my pretty graph. However, even with that noticeable blemish, I am still on a trend to see close to $50,000 net in 4-months time by November. However, this is based off of only 7 points of data, so it’s still a very loose projection. As time goes on though, the projection will only get more and more accurate, which is pretty cool. So to date, I’ve made $241,649.11, and this time the projection is set for the end of the year. 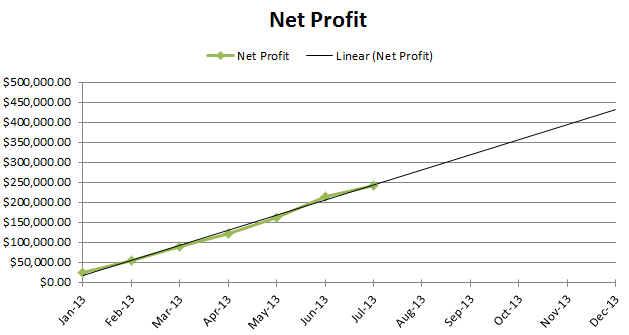 The linear projection predicts that I’ll finish the year somewhere around the $425,000 net profit mark. What’s interesting is how the linear projection compares to the way I usually predict numbers, which is by taking the current total average and multiplying that by the total timeframe. When I do that, I get $368,499.36 as the magic number – so around a $50,000 difference. I personally prefer my usual method, but at the same time it’s interesting to compare the two. July was a bit of an interesting month for me. For the first half, I was having major eye issues. It got so bad to the point where I simply couldn’t work anymore. As a result, I missed out on a lot of working hours. It was really scary and annoying. Fortunately, I got that mostly fixed (hopefully fully fixed soon) and I can see again. Once I got my sight back, I put in a good effort on my campaigns. I ran 12 or so new offers, and made many campaigns. I didn’t try any new traffic sources though. I also created around 6 or so new landing pages, with very mixed results. I forgot how fun split-testing landing pages can be (once the landing pages are done that is!) as I usually direct link. I found some great new campaigns, but as luck would have it, they all went down pretty much immediately after I ran them. I’m working on getting them back. I’d say I have a 75% chance of at least 1 of those new offers returning. I spent a fair bit of money in July on running new campaigns. If I hadn’t, I probably could have netted a little bit over $30,000 for the month, but spending money to try to make more money is what affiliate marketing is all about. Other than affiliate marketing, I worked hard on tackling my never-ending e-mail inbox. It currently stands at 202 e-mails. I made a ton of progress on that (I was at 609 exactly 1 month ago) so I’m happy with that. After I’m caught up with e-mail (at least 99% of e-mail… there are some that require a lot more time that I put "on hold"), I’ll be 100% focused on finishing my corporate income taxes until they are done. I’m already so late on them and owe both interest and penalties on them, but I’m very confident I’ll finally have them done and paid for in August. After all that stuff is done (hopefully! ), my goal is to sell at least 1 more website. Affiliate marketing-wise, I don’t plan on doing too much new with affiliate marketing. I’ll most likely run some new campaigns and stuff, but my priorities lie in getting my e-mails and taxes taken care of. There are so many factors that come into play when it comes to affiliate marketing that it’s really tricky to accurately predict how the month will do – at least for my campaigns. Unfortunately, I think that I may see another drop again in August – nothing too drastic, but currently it looks like it may be around $15,000 – $20,000 net profit. I certainly hope I’m wrong, as having two declining months in a row is not a good trend. We’ll just have to wait and see. Check back on September 1st to see the results! Now – how did July treat you for your affiliate marketing campaigns? Thanks for posting these…really motivating to me. I started running campaigns about a week ago after I read your “get started now” post, but haven’t had much luck yet. Of course I was making some silly mistakes I’m just now spotting, but I do want to ask what % of offers do you find actually work out for you? I’m trying to decide if I need to let these campaigns run a bit longer or if it’s better to just decide early on it’s a lousy offer (or I don’t know how to market it properly) and move on to the next. I believe the more experienced you are, the quicker you will know if an offer has potential or not. Since you’re just starting out, I’d be patient before scrapping the offer. For me, maybe 1 in 10 offers I run actually work. However, I’m sure that more knowledgable affilates than I could have run those same offers and got 5 or more of them to work, so experience and knowledge is a big factor. Why don’t you just hire someone to do your emails, or at least filter them? Well I let them stockpile once I really started getting things going with affiliate marketing. I suddenly shifted the vast majority of my time to working on my campaigns, so it took a while to adjust things accordingly. I’m close to caught up now though, and once I sell some more websites, the e-mails will lessen as well. No need to worry about that its just about how much quality work you do in the given time that generates the right income for you. Maybe you had some other priorities hope to see a new record this time from you. May not be your best income month but at least you had the best ROI, 70% seems pretty awesome. Yeah but all that matters is net profit. I could have a 480% ROI, but only make $50. This is amazing. I’m currently sifting through your articles for a beginning so I can see your overall progress (not quite there yet). However, I am interested in this sort of thing; I’m figuring that it’s going to take a lot of experimenting. How much did you have to spend to actually see any amount of profit? It is quite natural that it goes down in July and August, people have vacation or it’s too hot many times. I know many great bloggers who see sharp downturns of visitors this month. It’s just to come back in September with nice figures. You’ve made that much from cpa offers under 10$? Are you doing 5 types of traffic sources as in mobile, ppv, media buys, etc…? I mainly do PPC and PPV. what is your percentage of campaigns that lead directly to the merchant/product seller VS campaigns that take the user to a landing page of your own? what do you suggest to people getting started in AM. Creating their own landers or taking people to the product directly? 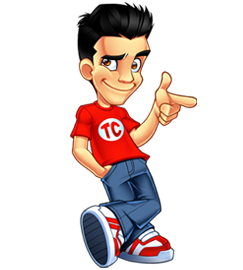 My ultimate goal so far in affiliate marketing is the numbers you are currently hitting…. Do you have a general outline in your blog archives, an ebook, or a product that shows how you did it? Is it just testing and experience? Its great to see that it can be done with direct linking…. Thanks! Read through my archives. There are also some detailed and long videos that give a very good walkthrough of what I do. Here it comes another inspirational post. I am amazed that July earning decreased. Hope you will recover soon. Tyler, just curious… do you have a dollar amount or % of income you limit yourself to in testing? Or did you early on? Was it just limited by your disposable/losable income? I understand if you’re making a return with something, then throw as much $$ at it as you can, but just curious how you handle the losses. There’s no exact number or rule I use as it depends on the situation. For example, I may try a new campaign that fluctuates wildly from landing page to landing page. In this case, I would want to do a lot more testing. As another example, I may run an offer that has a -90% ROI and shows absolutely no promise. In such as case, I will scrap it a lot quicker. You definitely need a decent amount of disposable spending money (funds that you can lose and be okay with) in affiliate marketing. I personnally recommend a minimum of $1,000 a month. That gives you around $30 a day to work with, not counting upfront costs such as software, hosting, etc. Good motivator. Reminds me of my own income with matching calculations and sighs. Drops can sometimes be a foreseen happening, but not all the time. That’s why it’s really important to save whenever possible. Lately it’s been an average of 3-4 hours a day… everyday. Wow Tyler, that’s great – wouldn’t ever get such insights from a friend but you are a total stranger and still shared it with us. Tyler can you make a post about your social efforts? Any good practices/bad experiences and tests? Loved the insight and you experience after this. Will try this in my next project and will test it for sure! Thanks for sharing this since it is very hard to find content somewhere close to yours, everyone else is just posting general data and nothing straigh-forward.